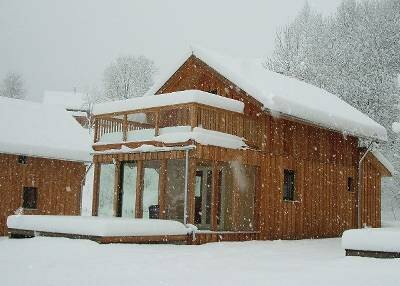 Traditional Austrian self catering 2 bedroom ski chalet which sleeps up to 8. Near to the Kreischberg ski resort, one of the most snow sure areas of Austria. Now with free WiFi. Spacious 2 storey chalet - located in a little hamlet just outside Stadl. Sleeps 4-8, with two bedrooms and two bathrooms, TV, living and dining areas, kitchen, conservatory and large upstairs balcony. The chalet is heated with a gas fire and under floor heating throughout, there is a family sized sauna and the all important boot warmer. There are local shops and many restaurants and bars just a short drive away. We have now installed WiFi and an ipod/mp3 player, so bring your ipod/phone and lead and listen to your favourite music. In the winter – skiing up to 2200mtrs it boasts some of Austria’s most snow sure skiing. In the summer – there is a stunning 18 hole golf course, horse riding, hiking, fishing, swimming and mountain biking. We are located next to many breathtaking mountain ranges. The chalet is only just over 1hours drive from the F1 Grand Prix circuit. For larger groups, or more than one family, we have access to other chalets on the complex, please email me for availability and prices. Please note the prices are shown in Euros. The nearby Hotel has a delivery service of fresh hot food to the chalet, details can be found in the chalet information book.